Will wrap up season 3. 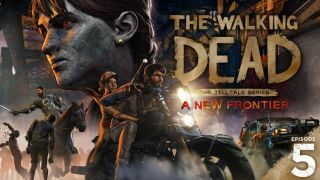 Episode 4 of A New Frontier—The Walking Dead's third season—arrived on April 25, and in an unusual move for Telltale, it's been announced that the next chapter will follow after it in a timely manner. Episode 5, AKA 'From the Gallows', AKA the finale, will release on Tuesday May 30. We'll have to wait until next week for the trailer, of course, but Telltale promises that From the Gallows will be the developer's "most tailored episode to date". "As you know, Richmond teeters on the brink of collapse, and the lives of its citizens and all those closest to Javier hang in the balance," Telltale's Scott Butterworth explains. "The decisions you've made and bonds you've nurtured will determine which characters now trust Javi to safeguard all they hold dear as this crisis pushes every relationship past its breaking point. "Obviously I’m not going to spoil anything, but...stuff’s about to go down. And don’t ask me about that key art!" That key art, above, certainly promises excitement: there's a motorbike, a horse, and a zombie throat being slashed with a sword. Chris Schilling reviewed the first two episodes of A New Frontier, and liked what he played. You can read his review here.